After a record-breaking tour and two national releases, there’s only one way to celebrate with ¡MAYDAY! The world’s most dangerous band invites you to their grand return to Miami for a blowout homecoming that will have the city lit up with Strange Music as the general, Tech N9ne, joins in the festivities for a very special night. That’s not all though. East Coast vet N.O.R.E and indie phenom Flawless Real Talk will also make guest appearances alongside DJ Entice, DJ Affect, and DJ Sharpsound. This is one unbelievable event jam-packed with surprises that you won’t want to miss. 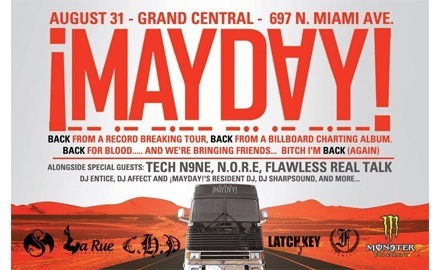 Throw back the Jack, put your shades on, and celebrate ¡MAYDAY!’s return to Miami! Grand Central – 697 N. Miami Ave.
Will you be in attendance for this one night only event?